Vital wheat gluten Suppliers, Vital wheat gluten Manufacturers. 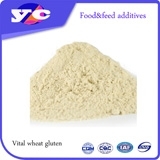 Product description: Vital Wheat Gluten is,FOOD GRADE, a light-yellow powder with the fragrance of wheat smell. It is a natural plant protein and nutritious food material, extracted from the wheat flour. Protein content is 83% minimium. It is composed by several types of amino acids with active protein source. Because of its unique elasticity, extensibility, hot solidification and film forming, it has been widely applied in food, beverage and animal feed industry. No.8 Hongtu Road, Dongxihu District, Wuhan City, Hubei Province, China.